Fingerprint Jewellery is stunning pure fine silver jewellery created from the unique impression of your baby's fingerprint or thumbprint. 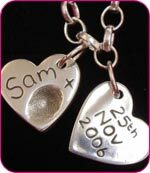 Anyone's fingerprint or thumbprint can be incorporated into a piece of Silver Fingerprint Jewellery, but ideally babies should be over the age of 6 months old, as prior to this they will have very little fingerprint definition. Your child or loved one's fingerprint can be transferred onto a wide choice of Silver Fingerprint Jewellery, including Cufflinks, Necklaces, Keyring, Rings and Pendants. Fingerprint Jewellery is a unique gift that will be treasured forever and is the perfect gift for any special occasion; Birthday, Christening, Mothers Day or Fathers Day.